Manager Ronny Deila insists Dutch defender Virgil van Dijk is staying at Celtic despite being left out of the squad for the visit to Dundee. The 23-year-old has been the subject of speculation over his future following Celtic's Champions League exit. 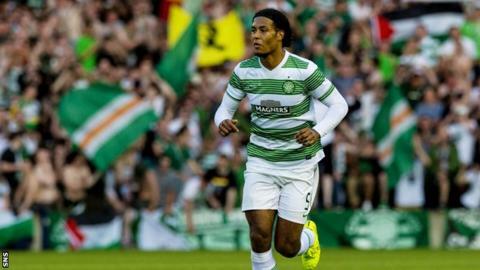 However, Deila said Van Dijk's omission was not a sign he will be leaving before the transfer window shuts. "He is going to stay here and that's the most important thing," the Norwegian said. "He is not here today because there has been a lot of speculation and his head has been thinking a lot. "His girlfriend is also pregnant and due soon. So he hasn't had the right focus, he wouldn't have been 100% today - that is why he didn't play. "He is a very important player for us and we have told him that there is no chance he is going to leave. "There is no chance we will let him go during this window. We couldn't replace him. "He wishes to get to a new stage. He is a young player and a young man and he will get many chances in his career. But now we need him here and he knows that and that is how it is going to be." On Friday, Celtic chief executive Peter Lawwell vowed the club would fight to keep the Dutchman. Van Dijk, who joined from Groningen last year, won Celtic player's player of the year award for last term, but was left frustrated when he was left out of the Netherlands squad for this summer's World Cup in Brazil. Celtic have agreed a deal with Sporting Gijon for Serbia striker Stefan Scepovic, who will join Deila's squad subject to a medical and work permit being granted. And Deila - who insists Leigh Griffiths will also be staying in Glasgow - hinted at more activity before Monday's transfer deadline. "There will maybe be more people coming in the last two days," he told BBC Radio Scotland. "I think we're very close to getting Scepovic ready and we'll see if we do something more. "There's too much speculation, [we need to] get it out the way now. We're going to get the players we want to get in and we're going to work to improve and get the results we want. "We'll get competition into the team and new blood. I think we will be stronger after the window than before."